"Contrary to expectations of quick implementation, the BLF will likely require a long lead time of rule-writing and data-gathering before revenue can be collected. Ohio took seven years to phase in its Commercial Activities Tax, Texas took three years to begin collecting its Margin Tax (and collections were off the estimate by one-third even with the long lead time), and Washington state has modified its Business & Occupation Tax almost constantly over its 80-year existence. Lessons learned from these states about going slowly and writing clear rules were not incorporated into the BLF proposal. 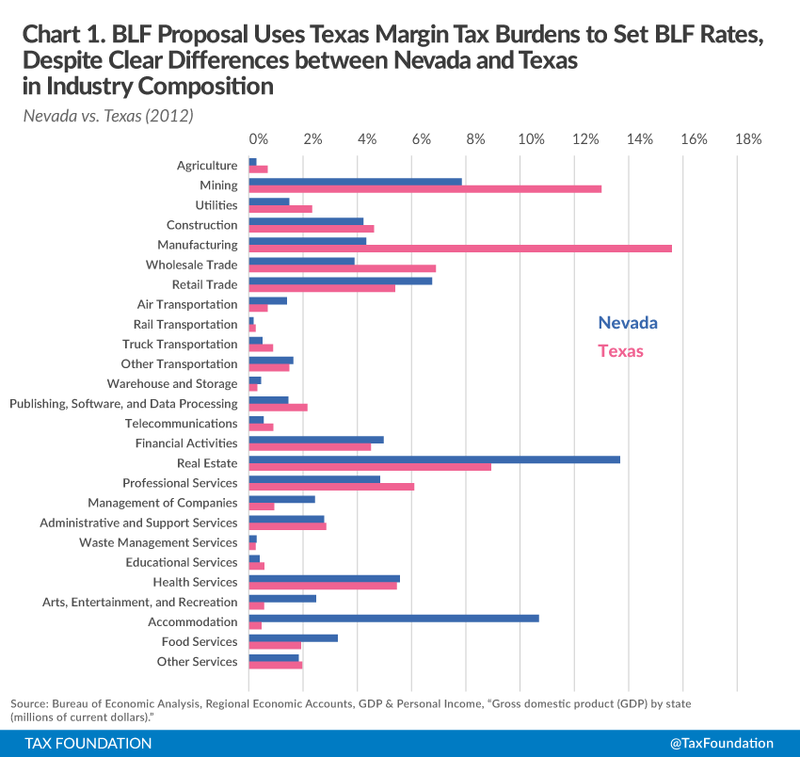 Furthermore, the BLF proposal’s designers reject the likelihood of non-payroll businesses currently domiciled in Nevada choosing to relocate to other states rather than pay a greater BLF, which would mean the revenue estimate is significantly overstated (by as much as $100 million per year). Tax reform is long overdue for Nevada. But creating sound tax policy is more than a question of how much revenue is being raised and whether that amount is too much or not enough. Public finance experts and economists generally agree that not all taxes are created equal, and certain types of taxes are more damaging to the economy than others. Gross receipts taxes are uniformly considered to be among the worst of these. With four states recently repealing taxes resembling the BLF proposal and three others (Ohio, Texas, and Washington state) seriously considering proposals to reduce or eliminate theirs, Nevada should be careful about establishing a complex, arbitrary tax structure that will harm long-term economic development and growth. Source: Tax Foundation review of SB 252 and compilation of Fiscal Analysis Division data (see Note 1). That is what the BLF proposal does, to take one category (retail) as an example. The Texas study found that manufacturers in 2011 paid $706,417,000 in margin tax on gross receipts of $387,133,000,000, for an average effective tax rate of 0.182 percent. That 0.182 percent figure was applied to the BLF, then adjusted by factor of 54.7 percent to match the revenue goal of $250 million per year. (Some categories are increased because they face a reduced tax rate in Texas.) The resultant 0.10 percent rate was then applied against the revenue thresholds to produce the dollar amounts in the BLF table. Table 2 shows the calculation process for each industry category. Once the 27 different industry rates are factored in, the result is a tax rate schedule containing 1,811 possible flat-dollar amount tax liabilities (see Appendix A for the full table). Source: Tax Foundation review of SB 252; Governor’s office; Texas Comptroller. Source: Tax Foundation calculation of highest tax rate faced by each industry category in SB 252. Source: Guinn Center for Policy Priorities. History demonstrates how difficult it can be to base business tax categories on NAICS codes. In 2005, Nevada Senate Bill 391 was introduced to recategorize pawn shops and collection agencies, which were placed under the NAICS “financial institutions” category and thus had to pay a higher MBT rate. An investigation committee under Senator Mike McGinness and Assemblyman David Parks suggested avoiding NAICS codes when defining financial institutions and recommended that Nevada “replace the current language … which relies on NAICS to classify or define financial institutions.” The Department of Taxation reported that April that it had “already done over 500 appeals on this issue” and had hundreds more outstanding. The appeals involved sorting businesses into two categories, financial and non-financial, for purposes of the Modified Business Tax. The BLF proposal would sort businesses into 29 categories. Texas has also faced considerable ongoing litigation regarding industry categories, even though they only have three (wholesalers, retailers, all other). Fees defray the cost of providing a particularized benefit while taxes generate revenue for general purposes. This is not just semantics or an obscure legal doctrine: policymakers have a strong incentive to avoid labeling something a “tax” so as to avoid the political poison of being labeled a “tax hiker.” For some elected officials, the best tax is one that raises lots of money without anyone calling it a tax. But taxes that are not called taxes violate the principle of transparency by depriving taxpayers of information needed to make meaningful choices about priorities. This is especially important for gross receipts taxes, which are hidden in consumer prices and are less transparent than other forms of taxation. Further, many states (including Nevada) require legislative supermajorities to enact taxes, so terminology is important. The authors are grateful to the public finance and state tax scholars who assisted our research and analysis of the Nevada BLF proposal, including Dr. John Mikesell, Professor of Public Finance at Indiana University and author of the textbook Fiscal Administration; David Brunori, Research Professor of State Taxation and Public Policy at George Washington University and author of the textbook State Tax Policy and the book The Future of State Taxation; Dr. Antony Davies, Associate Professor of Economics at Duquesne University; Dr. Fred Thompson, Professor of Public Management and Policy at Williamette University; Dr. Morris Coats, Professor of Economics at Nicholls State University (Louisiana); and Dr. Pavel Yakovlev, Associate Professor of Economics at Palumbo Donahue School of Business (Pennsylvania). We are also grateful to the past public finance research into the Washington B&O tax by Dr. Andrew Chamberlain and Dr. Patrick Fleenor, which is incorporated in our analysis. See, e.g., KPMG, Cat Got Your Tongue? Navigating the Complexities of Ohio’s New Commercial Activity Tax (2005), http://us.kpmg.com/microsite/tax/salt/perspectives/Fall_2005-02.asp; Joseph Henchman, Ohio Officials Agree to Cancel Income Tax Cut, Tax Foundation Tax Policy Blog (Dec. 2009), https://taxfoundation.org/blog/ohio-officials-agree-cancel-income-tax-cut; Billy Hamilton, The Tax That Fell to Earth: Lessons From the Texas Margin Tax’s Launch, 57 State Tax Notes 671 (Sep. 2010); Scott Drenkard, The Texas Margin Tax: A Failed Experiment, Tax Foundation Special Report No. 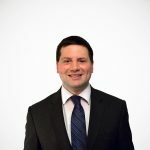 226 (Jan. 2015), https://taxfoundation.org/article/texas-margin-tax-failed-experiment; Liz Malm & Jared Walczak, The Steadily Growing Complexity of the Washington Business & Occupation Tax, Tax Foundation Fiscal Fact (forthcoming Apr. 2015). See, e.g., Liz Malm, Joseph Henchman, Jared Walczak, & Scott Drenkard, Simplifying Nevada’s Taxes: A Framework for the Future (Jan. 2015), https://taxfoundation.org/article/simplifying-nevadas-taxes-framework-future. Nev. Rev. Stat. § 76.010 et seq. The current BLF is paid by all persons conducting business in Nevada with or without a location or employees except governmental entities; nonprofit religious, charitable, or educational associations; a person who operates an in-home business which generates less than 66-2/3% of the average annual wage; or a business that creates or produces motion pictures. S.B. 252, Nev. 78th Sess. (2015), https://www.leg.state.nv.us/App/NELIS/REL/78th2015/Bill/1732/Overview. The proposed BLF would be collected on most types of business receipts from the sale of goods or revenue realized in the performance of a service” — that is, gross receipts. Hearing on S.B. 252 Before the Joint Meeting of the Senate Committee on Revenue and Economic Development and the Assembly Committee on Taxation, 78th Sess. (Mar. 18, 2015), https://www.leg.state.nv.us/App/NELIS/REL/78th2015/Meeting/3288?p=1003288. In FY 2014, there were 47,146 Nevada businesses with payroll of $38.3 billion, of whom 34,955 (74.1 percent) were fully exempt from the MBT due to a quarterly exemption threshold enacted in 2011 at $62,500 and raised in 2013 to $85,000. This leaves 12,191 (25.9 percent) of Nevada businesses with payroll as MBT taxpayers. See Fiscal Analysis Division, Modified Business Tax on Nonfinancial Businesses by NAICS Business Category for FY 2014, https://www.leg.state.nv.us/App/NELIS/REL/78th2015/ExhibitDocument/OpenExhibitDocument/10615/MBT-NFI_FY2014%20Data%20Tables%202%20and%203.pdf. Nevada is second only to Delaware as a popular location for non-employer businesses to locate, with approximately 180,000 non-employer businesses (and 30,000 sole proprietor businesses) paying the existing BLF but not the MBT. Thus, while only about 4.7 percent of Nevada businesses pay the MBT, 80 percent of state payroll ($30.5 billion) is subject to the MBT, and if the MBT exemption were removed, 100 percent of businesses with payroll would be paying the MBT, and 100 percent of Nevada businesses would be paying the MBT and/or the existing BLF. A broad-based MBT would capture all businesses with payroll; the proposed graduated-rate BLF structure would capture all businesses with more than $125,000 in Nevada Gross Revenue. These categories would be largely, but not entirely, synonymous. Some small businesses could have an employee but less than $125,000 in gross revenue, and thus be subject to a broad-based MBT but not the BLF. Some out-of-state firms will have more than $125,000 in Nevada gross receipts but no in-state employees (e.g., an out-of-state advertising firm that works with clients in Nevada), and thus subject to the graduated-rate BLF but not an expanded MBT. Still other firms might have Nevada employees but contract with out-of-state firms (e.g., an independent, Nevada-based call center contracting with out-of-state firms), thus having no Nevada gross receipts, making them taxable under a broad-based MBT but not a graduated-rate BLF. These differences are, however, the exceptions that prove the rule. For all practical purposes, the number of businesses subject to a broad-based MBT and the graduated-rate BLF structure would be practically identical. Hybrid business taxes including a gross receipts component also exist at the state level in Delaware and New Hampshire and at the local level in Virginia. Broad-based sales taxes in Hawaii and New Mexico are sometimes inaccurately described as gross receipts taxes because the legal incidence of the tax in those states falls on business instead of consumers, but in all other respects the taxes best fit the category of sales taxes. Andrew Chamberlain and Patrick Fleenor, Tax Pyramiding: The Economic Consequences of Gross Receipts Taxes, Tax Foundation Special Report No. 147 (Dec. 2006) at 5, https://taxfoundation.org/sites/default/files/docs/sr147.pdf. Washington State Tax Structure Study Committee, Tax Alternatives for Washington State: A Report to the Legislature, Volumes 1 & 2 (Nov. 2002), http://dor.wa.gov/content/aboutus/statisticsandreports/wataxstudy/final_report.htm. The report used is Texas Comptroller of Public Accounts, The Business Tax Advisory Committee Report to The 83rd Texas Legislature (Jan. 2013), http://www.window.state.tx.us/taxinfo/btac/96-1364_BTAC_Report_2013.pdf. George R. Zodrow, Texas Tax Options, James A. Baker III Institute for Public Policy, Rice University (Jan. 2006), http://bakerinstitute.org/media/files/Research/a3823166/wp_2006002.pdf. Hearing on S.B. 252 Before the Senate Committee of the Whole, Nev. 78th Sess. (Mar. 19, 2015), https://www.leg.state.nv.us/App/NELIS/REL/78th2015/Meeting/3312?p=1003312. Guinn Center for Policy Priorities, The Business License Fee: What We Still Don’t Know (Mar. 2015), http://guinncenter.org/wp-content/uploads/2015/03/Guinn-Center-Tax-Policy-Brief-for-Legislators_March_17.pdf​. “There are four kinds of business: tourism, food service, railroads, and sales. [Pause.] And hospitals slash manufacturing. And air travel.” Michael Scott, The Office (Season 3, Episode 6, “Business School,” aired Feb. 15, 2007). See, e.g., Washington State Tax Structure Committee, Tax Alternatives for Washington State: A Report to the Legislature (Nov. 2002) at Chapter 9 and Appendix C, http://dor.wa.gov/content/aboutus/statisticsandreports/wataxstudy/final_report.htm; B&O Tax Pyramiding in Petroleum Distribution, Washington Research Council Special Report (Jan. 18, 2010), https://researchcouncil.files.wordpress.com/2013/08/botaxpyramidinginpetrodist.pdf; Carl Gipson, Business & Occupation Tax Reform, Part II, Washington Policy Center Policy Note (Aug. 2008), https://www.washingtonpolicy.org/sites/default/files/B&OPart2.pdf; and Safeway, Inc. v. Department of Revenue, 978 P.2d 559 (Wash. Ct. App. 1999). Liz Malm & Jared Walczak, The Steadily Growing Complexity of the Washington Business & Occupation Tax, Tax Foundation Fiscal Fact (forthcoming Apr. 2015). Nevada Legislative Committee on Taxation, Public Revenue, and Tax Policy, Bulletin No. 05-18 (Jan. 2005), at 31, https://www.leg.state.nv.us/Division/Research/Publications/InterimReports/2005/Bulletin05-18.pdf. Minutes of the Nevada Senate Committee on Taxation (Apr. 7, 2005), http://www.leg.state.nv.us/73rd/Minutes/Senate/TAX/Final/4095.pdf. Scott Drenkard, The Texas Margin Tax: A Failed Experiment, Tax Foundation Special Report No. 226 (Jan. 2015) at 5-6, https://taxfoundation.org/article/texas-margin-tax-failed-experiment. See, supra, KPMG, Cat Got Your Tongue? Navigating the Complexities of Ohio’s New Commercial Activity Tax (2005), footnote 2. See, supra, Hearing on S.B. 252 Before the Senate Committee of the Whole, Nev. 78th Sess. (Mar. 19, 2015), footnote 15. Assemblywoman Marilyn Kirkpatrick asked witnesses to what extent filings dropped after the 2009 increase in the BLF from $100 to $200. Witnesses replied that filings dropped, although separating out the recessionary impact and the fee increase is difficult. Estimated BLF-paying entities peaked in 2008 at 321,000; subsequent years were 2009 (290,000), 2010 (280,000), 2011 (287,000), 2012 (282,000), 2013 (290,000), and 2014 (300,000). Even setting aside the new graduated rate structure, the $200 increase in the base license fee will have a significant impact on businesses which tend to file for a sizable number of business licenses for financial or liability reasons. Dr. David Swanson, Dr. Robert Schmidt, Dr. John Ziebell, Dr. David Atkinson, and Katriina Talja, Proposed Nevada Business License Fee Increase & Gross Receipts Margin Tax (Mar. 2015). See Joseph Henchman, How is the Money Used? Federal and State Cases Distinguishing Taxes and Fees (2013), https://files.taxfoundation.org/docs/TaxesandFeesBook.pdf. Clean Water Coalition v. The M Resort, LLC, 255 P.3d 247, 256 (Nev. 2011). J.D. Adams Mfg. Co. v. Storen, 304 U.S. 307, 311 (1938). See Fisher’s Blend Station, Inc. v. Tax Comm’n of State of Washington, 297 U.S. 650, 656 (1936). Gwin, White, & Prince, 305 U.S. at 439. Western Live Stock v. Bureau of Revenue, 303 U.S. 250, 257 (1938). 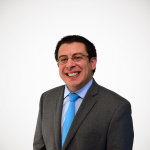 Interestingly, that case involved New Mexico’s 2 percent gross receipts tax on newspaper and magazine advertising; Grosjean was not cited by the Court. Armco, Inc. v. Hardesty, 467 U.S. 638, 644 (1984). State Tax Guide, CCH Incorporated, at 9141-6 to 9141-7 (May 2006 update). Jason Smith, A Concise History of Washington’s Tax Structure, Economic Opportunity Institute Blueprint, at 8, http://www.eoionline.org/Taxes/WATaxHistory.pdf. Gwin, White, & Prince, Inc., see supra note 7. See also Smith, at 8 (“In response, the Washington Legislature implemented several specific credits to reduce the possibility of double taxation for manufacturing firms that do business in this and other states.”). Tyler Pipe Industries, Inc. v. Washington State Dept. of Revenue, 483 U.S. 232 (1987). E.g., David F. Shores, “State Taxation of Gross Receipts and the Negative Commerce Clause,” 54 Mo. L. Rev. 555, 589 (1989) (“[T]he Court first found that the manufacturing and wholesaling taxes [were discriminatory because they] created a risk of multiple taxation for interstate transactions which did not exist for intrastate transactions. … Yet for purposes of the apportionment issue, the Court said there was no risk of multiple taxation because it had already characterized the taxes as noncompensating. Obviously, the Court cannot have it both ways,”). The Court rejected Tyler Pipe’s argument that the wholesaling tax, which could not be waived, was not fairly apportioned to account for activity in different states. The Court stated that “wholesaling … must be viewed as a separate activity conducted wholly within Washington that no other State has jurisdiction to tax.” Tyler Pipe, 483 U.S. at 251. Shores suspects that multiple taxation of gross receipts would be found unconstitutional only if it is facially discriminatory. See Shores, 54 Mo. L. Rev. at 589-90. CSX Transp. v. Ala. Dept. of Revenue, 562 U.S. 277 (2012). Ala. Dept. of Revenue v. CSX Transp., No. 13-553 (U.S. Mar. 4, 2015).